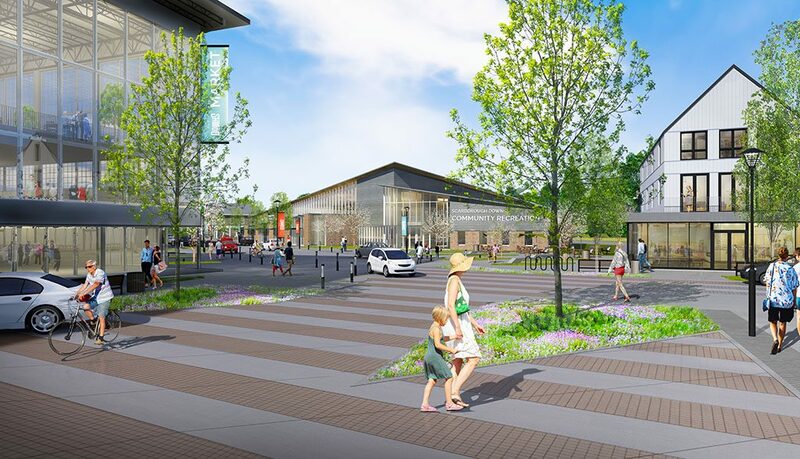 SCARBOROUGH — Scarborough Downs is on track to be redeveloped into a mixed-use village center under a 30-year, tax-supported plan approved by the Town Council on Wednesday night. The deal with hometown developers was widely considered one of the most important and contentious decisions to face the council in decades, prompting Councilor Don Hamill to fly back from a vacation in Ireland just to vote against it. The council approved a credit enhancement agreement that would reimburse as much as $81 million in property taxes to the developers over three decades if they meet certain goals in redeveloping the 500-acre harness racing venue. The vote was 4-3, with councilors Hamill, Peter Hayes and Paul Johnson in opposition, citing concerns about potential risks to the town and impact on taxpayers. To capture taxes generated by the new development, the council approved a larger 955-acre tax increment financing district that includes a stretch of Route 1 and the Oak Hill commercial area. The council also approved the Downtown Redevelopment Plan that is the basis for the credit and tax agreements. The vote was 5-2 on each of the latter aspects of the deal, with Hayes and Hamill opposed. Under the credit enhancement agreement, the town would reimburse at least 40 percent of property taxes captured in the Downs segment of the larger tax increment financing district. The developers are expected to use the reimbursement to offset about $150 million in project development costs related to the village-center concept, such as building 8 miles of road and extending wastewater service from Route 1, across the parcel, to Payne Road. Additional credit agreements would be necessary if they built a proposed community center or 4-acre park in the downtown. The Downs was purchased in January for $6.7 million by a group of longtime Scarborough residents consisting of Rocco, William and Marc Risbara, owners of Risbara Bros. Construction; and Peter and Richard Michaud, former owners of Michaud Distributors, a Northeast regional snack delivery company. Scarborough doesn’t have a traditional downtown and several years ago it passed special zoning to allow a village center at the Downs. Located off Route 1 and Exit 42 of the Maine Turnpike/Interstate 95, the Downs continues to host seasonal harness racing, but the business has struggled for more than a decade. The previous owners entertained more than a dozen interested buyers, including unsuccessful casino proposals, before Crossroads Holdings clinched the sale. Under the proposed village-center scenario, if the brothers succeed in developing $615 million in new assessed value at the Downs within 20 years, the town would collect $581 million in additional property and excise taxes over 30 years and spend $235 million to provide additional public services to residents and businesses in that area. The total build-out would include $396 million in housing, $143 million in commercial space and $75 million in industrial space. The deal limits the number of single-family homes that can be built at the Downs to 450 and encourages commercial and light-industrial development, Town Manager Tom Hall said. According to projections by the developers and the town, the redeveloped Downs would add 1,986 housing units (23 percent) to the town’s 8,508 current housing units, 3,634 residents (18 percent) to the town’s 20,023 current population and 347 kids (12 percent) to the 2,929 school-age children living in Scarborough now. The Downs also would create 2,400 to 3,350 jobs, about 1.2 million square feet of commercial space, about 800,000 square feet of industrial space and 8 miles of new roads. About a dozen residents spoke in favor of the deal and a couple questioned it.